Cross-posted on Medium, joint with Ali Ayoub. For investors in real estate, however, the rollercoaster of the Amazon search, selection, and deselection of an additional location for its headquarters had and continues to have material implications. After all, just the prospect of landing the headquarters of a company planning to employ 40,000 highly paid workers, let alone the creation of thousands of indirect jobs, makes mouths water. Think of the apartments and homes needed. Think of the office space required. The retail that all these hipster millennials need. Yoga studios, juice bars, … etc. Many markets on the shortlist announced January 18, 2018, saw heightened investor interest in anticipation of Amazon’s final choice. Of course, when the final word came with not one but two additional future headquarters — Long Island City (NY) and Arlington County (VA) — capital markets really started to rumble. Then when Long Island subsequently got nixed, earmarked capital immediately began to dissipate. There is a lot of speculation about the impact of corporate moves such as the Amazon example (but also: Google’s increasing presence in Manhattan, Facebook’s move to San Francisco, etc.). Understanding the impact of the looming arrival of the world’s largest company (by market cap) on the value of commercial real estate assets presents a significant challenge. After all, commercial real estate assets don’t trade frequently, and certainly not with sufficient numbers to measure market changes in pricing at the local level. (I’ll leave the technical details of index construction out, but ideally, you measure market trends by analyzing repeat sales, or multiple sales of the same building — RCA, for example, is using that technology for their indices.) To assess the appreciation or depreciation of commercial real estate, the industry, therefore, relies on manual appraisals, typically done once every 1–3 years for a given building. But, how does an appraiser incorporate the prospect of a company establishing a presence in an area? Intuition can certainly give hints. Conservative estimates show that 40,000 people need 4 million square feet of office space, 30–35,000 apartments (even on an Amazon HQ wage, you can’t always afford a studio or home for yourself), and the average U.S. consumer has 23.5 sq.ft. of retail space at its disposal (although I suspect that Amazon employees live their shopping life predominantly online). That’s a lot of additional demand for space, and indeed, early market evidence from Crystal City show that some of it is already materializing! In addition, more investor capital will flow into the market, lowering return expectations (the “cap rate,” in real estate jargon) and increasing prices. But it’s easy to see that translating intuition into the valuation of commercial real estate is hard! One way to gauge the impact of Amazon on the local commercial real estate market is to look at the price of publicly traded REITs with exposure to either one or both Amazon locations. For example, JBG Smith, an office REIT, has about a third of its portfolio located in Arlington County (other REITs owning assets at that location include Simon Property Group, Equity Residential, Ashford Hospitality Trust, Vornado Realty Trust, and a few more). The maps below show REIT-owned assets both in Long Island City and in Crystal City. The announcement by Amazon wasn’t necessarily the cleanest ‘event,’ as markets had some anticipation of location choice (a CEO that has a home in the area seems to be a reliable predictor of company HQ choice). But still, the stock price of JBG Smith outperformed the broader REIT index around the announcement of Amazon, and its stock rose further when Amazon decided not to go to NY after all (Schadenfreude, as the Germans call it). The change in REIT pricing reflects investor perception of the change in portfolio asset value. However, it doesn’t tell us exactly or directly how the valuation of individual assets changed. Another (indirect) way to look at the impact of the Amazon HQ location choice on the commercial real estate market is to analyze housing prices. Compared to the commercial real estate market, the housing market is liquid and deep — an average of 14,000 homes and apartments sell every day! The leading homes sales and rental platform, Zillow, provides a detailed set of monthly home price and rent indices, available at the ZIP code level. After the announcement of Amazon to split the “new” HQ between Arlington and Long Island City, Zillow analyzed predicted price and rent growth. Now, a few months after the announcement, and with hindsight knowledge of the retraction out of Long Island City, we can look at actual data. The figure below plots the development of the Zillow Home Value Index (based on Zillow’s Zestimate, standardized to 100 on August 1, 2018) and the Zillow Rent Index. Interestingly, housing prices in Long Island City rose in anticipation of the Amazon announcement, but they started to decline right after the Amazon announcement to locate in Long Island City, perhaps in anticipation of what was to come…? For rents, we see a reverse effect. Asking rents declined until just before Amazon made its announcement to move to Long Island City, at which point rents started to increase quite rapidly. Unfortunately, that growth began to decrease after the pivotal moment of the LIC pullout. While it may seem far fetched to relate house prices and rent developments to changes in commercial real estate markets, that’s precisely what a modern data-driven valuation does. It relates the price of commercial real estate assets to quantitative, observable fundamentals in the local market and in the macroeconomy. Of course, this plethora of information cannot filter into property valuation manually, it requires machine learning models that already power so many products and industries. Automated valuation models (AVMs) for commercial real estate are able to incorporate hundreds of variables (technically, the number of variables could be unlimited, but some adult supervision is helpful), using sources updated as frequently as daily. Think about the movement in the stock market and in interest rates. Both are inputs into the cost of capital, and thus the value of commercial real estate. Think about jobs, income levels, and income changes. Consider ‘hyperlocal’ metrics such as crime, events, amenities, and access to public transit. The GeoPhy AVM includes a number of features that reflect levels of and changes in house prices — from local house price indices to permit data, and from local housing market rents to market velocity. The picture below shows how GeoPhy valuations of commercial real estate change based on a percentage change in house price-related features (note this is ceteris paribus, so everything else in the models stays constant). Now, what would the impact of Amazon on Long Island City’s commercial real estate market have been? There are many factors that would have changed in the process, but looking at changes in housing prices alone, we estimate that commercial real estate values increased by approximately one percent in anticipation of, and subsequent to Amazon’s decision to locate in NY. We’re still in the process of bubble deflation, but we expect this effect to disappear rather quickly. For buy-and-hold investors, similar to those following the Amazon saga with nothing but bemusement, the Amazon flip-flop was thus merely a blip, and they likely haven’t even noticed the change in value of their assets. But. . . the GeoPhy AVM indicates that real value was created in the Amazon location decision, and real value was eventually destroyed! The hurricane season has barely started, and the first monster hurricane is already upon us — Hurricane Florence is rapidly approaching the East Coast, and is expected to lead to significant material damage. Financial markets are pretty good bell-weathers on which industries will be hit hardest, with certain stocks sliding in advance of the storm making landfall. Indeed, Bloomberg reported earlier today on insurance stocks taking a battering, regional utility companies taking a hit, and firms with significant presence in the storm cone of Hurricane Florence (retail, banking, etc) going down. To better understand the exposure of the commercial real estate sector to storm and flood risk from Hurricane Florence, we analyzed the assets owned by real estate investment trusts (REITs) and assets that are collateral for loans bundled into commercial mortgage backed securities (CMBS). For context: REITs own 42,924 assets across the U.S., representing 6.2 billion sq.ft. of space (the REIT universe is based on the U.S. universe of the FTSE EPRA Nareit Developed index, the main REIT index used by REIT ETFs and REIT investors). Since 2012 (the start of the CMBS 2.0 era), more than 24,000 properties and loans have been bundled into CMBS deals, with a total appraised value (for what it’s worth) of more than USD500 billion (note that one building can be securitized into multiple CMBS deals, and that appraised values are missing for about 13% of the properties/loans). The National Ocean and Atmospheric Agency (NOAA) provides forecasts of the “storm cone” of Hurricane Florence as well as the area where storm surge is expected. Of course, these geographic boundaries are shifting on an on-going basis — we used the polygons as of September 12 at 8am ET. The maps below show the overlay of CMBS assets (left), REIT assets (right), and the NOAA-based storm path of Hurricane Florence, as well as storm surge areas. Some major urban areas are included in the current area that is forecasted to be impacted by the storm, areas where almost all REITs own assets and where many CMBS loans have collateral. In total, 94 out of 130 REITs are expected to be affected by Hurricane Florence, with some 5,545 assets (545,235,430 sq.ft.) in the storm area. REITs with the highest exposure include Cousins Properties (NYSE: CUZ), with 67% of its portfolio in the hurricane zone, apartment giant Mid-America Apartment Communities (NYSE: MAA), with about a third of its portfolio in the storm cone, and Blackstone-backed Invitation Homes (NYSE: INVH), with more than a fifth of its portfolio exposed. From an absolute perspective, REITs with a significant exposure include Equity Lifestyle Properties (NYSE: ELS), Public Storage (NYSE: PSA) and Duke Realty (NYSE: DRE). While investors are attuned to daily news about interest rates, employment figures, and the latest on the continuing trade war sage, financial markets are less apt to reflect the pending impact that climate events may have on asset values. We believe that thus far, the street has failed to incorporate the clear and present danger of Hurricane Florence into the price of both REITs and CMBS deals that are (heavily) exposed. Time for a trade? Maastricht University and CBRE just released the 5th annual Green Building Adoption Index -- it's pretty interesting! LOS ANGELES--(BUSINESS WIRE)--The nation’s largest cities are getting even greener, according to the fifth annual U.S. Green Building Adoption Index by CBRE and Maastricht University. Researchers have found green certified office space across America’s 30 largest metros has reached 41 percent of market totals – the highest in the index’s history. “Green” office buildings in the U.S. are defined as those that hold either an EPA ENERGY STAR® label, USGBC LEED certification or both. According to the report, 11.5 percent of all buildings surveyed are ENERGY STAR labeled, while 5.2 percent of buildings are LEED certified, both at all-time highs for the five-year study. This is the fifth release of the annual U.S. Green Building Adoption Index. Based on a rigorous methodology, the index shows the growth of ENERGY STAR- and LEED-certified space for the 30 largest U.S. office markets, both in aggregate and in individual markets, over the previous 10 years. A feature again this year is a geographic mapping platform that highlights the name, location and details of the specific green certification for each building in all 30 markets. View the study’s findings HERE. Over the past year, there have been quite a few headline-grabbing, wave-making deals where it has become clear that the “tech world” is increasingly advancing on “old world” real estate territory (with some notable “reverse-takeovers”). Think: Walmart buying Jet.com (2016), WeWork buying Lord and Taylor’s flagship store (2017), Walmart buying Flipkart (2018), etc. But none has created such a tsunami as Amazon buying Whole Foods. Until last year, the disruption of the bricks-and-mortar retail sector was mostly visible in the non-food space, with notable bankruptcies of for example Borders, Sports Authority, Toys R’ Us, and sharply falling prices of retail real estate (this price-correction is not yet accurately reflected in real estate valuations, but the public market provides better evidence of what is still to come: retail REITs are down some 45 percent from their 2016 highs). The advance of tech into retail has dominated industry conferences and spurred significant lobbying against what is often perceived as unfair competition (with even the Tweeter-in-Chief lashing out against Amazon). On June 16, 2017, big tech formally announced its presence in the grocery retail space, an industry that generates almost a trillion dollars in revenue per year. With Amazon buying Whole Foods, a high-end grocery that seduces taste buds while emptying wallets, online retail has now firmly established a foothold in physical U.S. retail territory. This unprecedented move excites the tech-savvy, scares retail investors, and has unleashed further speculation about the future of retail real estate (of course, there are still optimists out there). The map of Trader Joe’s and Whole Foods also provides an overlay of the unemployment rate, as a proxy for the local demographic profile (this map shows an overlay of education levels). Further comparisons of 2016 Census data in the graphs below show that the areas where Whole Foods and Trader Joe’s are located (measured by Census tract) are pretty much the same! Also note how dissimilar the profile is from the US average, with Trader Joe’s and Whole Foods located in areas that have, for example, median income that is higher than the national average by about 50 percent. Now, that raises an interesting perspective. What if another big online retail platform would want to get foot on US soil, gaining exposure to the most desired demographic group that the US has to offer? An easy way in would be to acquire Trader Joe’s! Of course, that is easier said than done — Trader Joe’s is wholly owned by Aldi Nord, which is owned by three different trusts. That said, we can think of quite a few online retailers that would (want to) eat Trader Joe’s for breakfast (and ideally, Aldi for lunch). Perhaps Alibaba, with some 62 billion in revenue and a market cap of almost 500 billion? The war chest of 200 billion should be sufficient to provide for even the frothiest of German valuations. Perhaps the acquisition of Trader Joe’s by Alibaba will be the sticker shocker for retail in 2018? This is a crosspost of my blog with Ali Ayoub on Medium. When it comes to natural disasters, buildings, once constructed, are much like sitting ducks. But ducks can fly, and buildings cannot (as of yet). Climate events, including for example storms, heatwaves, and floods, thus pose a significant risk to buildings, whether commercial or residential. The recent sequence of superstorms (and subsequent flooding events) in major U.S. cities serves as a tangible reminder (think: New York, Houston, San Juan, PR, etc.). And it’s not just storms and flooding, but also cold spells, heat waves, drought, periods of extended precipitation, tidal flooding. Heat and flooding regularly account for the most weather-related deaths in the U.S., according to the National Weather Service. While such climate events already happen on a frequent basis, there is reason to believe that both the intensity and incidence will increase going forward. The New York City Panel on Climate Change, re-convened in the wake of Hurricane Sandy, projects an increase in the most intense hurricanes and increased precipitation from hurricanes. For investors in real estate, be they shareholders of real estate investment trusts (REITs), direct investors in commercial real estate, or those investing through private equity firms, measuring exposure to climate risk often seems like a daunting task. However, the advent of (big) data has made climate risk analysis for real estate much more straightforward. On the one hand, maps of different types of climate risk are often publicly available. Although varying in detail and quality based on risk type and region, it is easy to access historical data on climate events, as well as forecasts of such events going forward (needless to say, a forecast is just that, and a high probability of an event occurring does not “guarantee” the event, think about earthquake risk in the San Francisco Bay Area). On the other hand, the location of real estate is fixed, and can be identified easily by a unique set of coordinates. Using the exact location of assets in an investment portfolio, investors can thus assess their exposure to flood risk, extreme temperatures, etc. with relative ease. Using data collected by GeoPhy, we investigate all buildings held by 133 equity REITs with assets in the U.S. (some of these REITs are Canadian) as of Q1 2017. These portfolios, which represent just the U.S. holdings of these REITs, add up to a grand total of 36,641 buildings, covering almost 3.7 billion sq. ft. (3,709,107,064 sq. ft., to be precise). The maps below show the location of REIT assets and the overlay of two different climate risk layers. First, we use the well-known FEMA flood risk data — the Federal Emergency Management Agency (FEMA) uses their assessment of flood risk for federal insurance purposes. While often criticized for being inaccurate (either indicating “false positives” or “false negatives”), the FEMA flood risk data is used widely in the real estate market. As a second climate risk layer, we use a forecast of total direct, financial climate damage as a percentage of county GDP. This data is based on recent research by The Climate Lab, published in the renowned Science journal. Using forecasts of changes in weather and climate (the medium IPCC scenario), this map shows the combined effect of these changes on agriculture, mortality, energy, low-risk labor, high-risk labor, coastal damages, property crime, and violent crime. Ultimately, this translates into a monetary effect on local GDP, as presented on the map. To get a better feel for how this affects real estate investors, we aggregate the data at the level of the REIT portfolio, both counting the number of buildings for each REIT portfolio that is exposed to flood risk and the broader measure of climate risk, as well as summing the total square footage of these buildings. 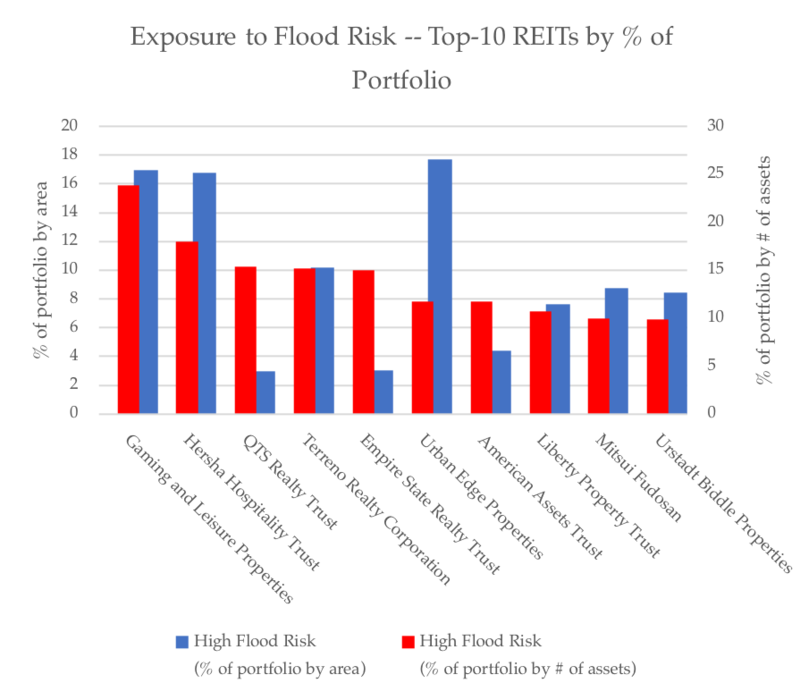 As it turns out, only 2 REITs are not affected by flood risk. The other 131 REITs are affected by flood risk— for these REITs, on average 87% of the portfolio measured by size (square footage) is exposed to at least some flood risk, as defined by FEMA. Looking at assets that are exposed to high risk, according to FEMA, about 5% of the average REIT portfolio is affected. That number may be small, but the value-at-risk is of course much higher. There is significant variation across REITs: Simon Property Group (SPG-N), the largest commercial real estate company in the world, has 85% of its portfolio in areas with low flood risk and 3% of its portfolio in areas with high flood risk, whereas 9% of assets in the Kilroy Realty Corporation (KRC) portfolio, one of the world’s “greenest” REITs, are exposed to high flood risk. 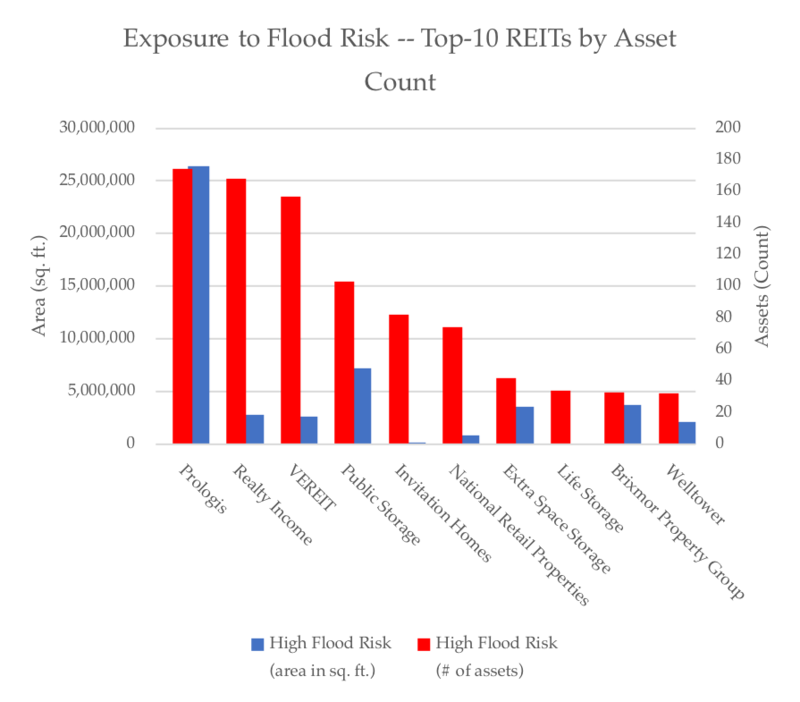 The figures below below show the top-10 REITs by flood risk exposure, measured by asset count, and the top-10 REITs by flood risk exposure, measured by percentage of the portfolio. As for climate risk, the data provides insight into the decrease in county GDP as a result of climate change — for each REIT, we calculate the exposure to such economic risk, by taking the average decrease in GDP across the counties where the REIT has assets. 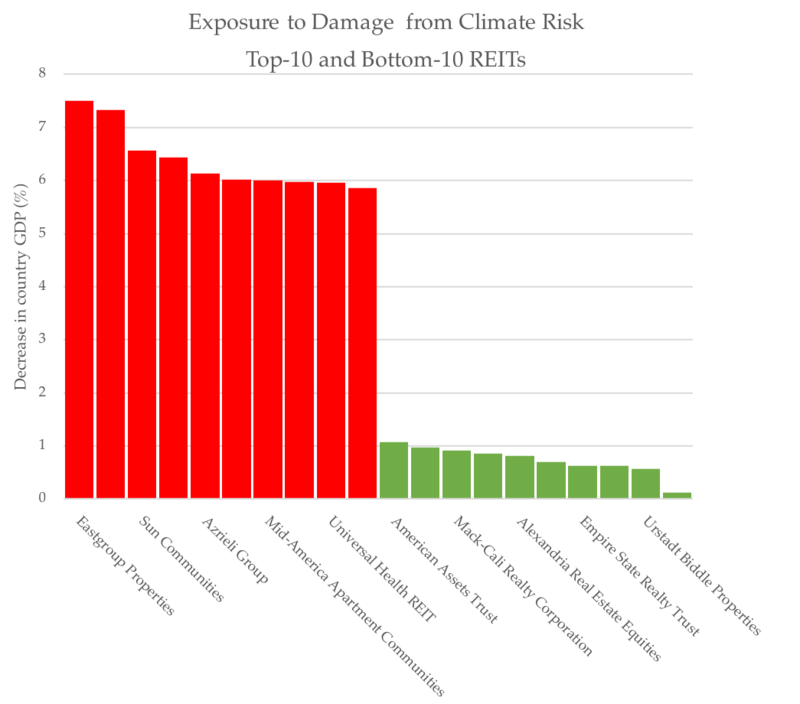 The figure below shows the top-10 and bottom-10 REITs by exposure to economic impact of climate risk. Of course, “being exposed” to climate risk is not a big deal per se. It merely means that as a REIT, or as an investor in a REIT, you are more, or less, exposed to climate events, now and in the future. Depending on the extent of (private) insurance, a climate event, be it large or small, may not necessarily lead to material effects for the portfolio. But such thinking is short-sighted, which would not be prudent for an investor in a long-lived asset. Government insurance programs for climate events largely go unfunded. And insurance premiums can be adjusted annually. The average duration of a commercial real estate investment is 5–7 years, and often longer still. As the incidence and intensity of climate events increases, future buyers of an asset will start to take climate risk into consideration in underwriting and pricing of an asset — risk, or uncertainty, translates in higher return requirements, thus leading to a lower price for assets that are exposed. Climate risk is, or should be, a non-partisan issue. Storms don’t recognize the political predisposition of an area, and neither does flooding. For (institutional) REIT investors, but also for investors in private equity real estate funds, or for direct investors in real estate, understanding exposure to any form of risk is paramount. The fiduciary duty of investors towards clients and trustees is the foundation of the capital market. Stewards of capital should carefully assess current and future risks. It’s time to add climate risk to the mix by using quantitative assessments of such risk, exploiting the insights that (big) data is increasingly bringing to the capital market. Today marks the release of the inaugural CBRE/Maastricht University International Green Building Adoption Index -- an index that reflects the uptake of "green" building certification (such as LEED, BREEAM, Green Star and other) across 10 major international property markets, including markets such as London, Paris, Toronto and Sydney. This index is joint work with Rogier Holtermans (now at USC, soon at University of Guelph) and Dave Pogue of CBRE. View the official press release or Download the report.